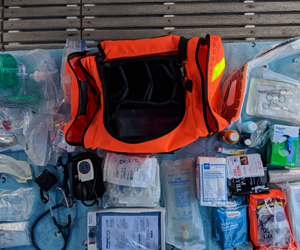 What’s in your medical kit … Given a lot of thought as to what to include in our medical kit for SV Exit Only especially since our recent medical incident. One needs to be prepared for different medical scenarios. Captain Dave is a recently retired ophthalmologist and I have 15 years experience working in the ER as a physician’s assistant. We opted to put together our own medical kit given our background. However, there are several companies who have pre-made medical kits available for cruising. With my background in ER, I already have the training to suture a wound, remove a foreign body, set a bone, put in a chest tube, start an IV, perform life support … etc. I have heard of several cruisers who have participated in Wilderness Medical Training or EMT training. I think that this is a fabulous idea and would highly recommend some basic medical training for anyone doing extensive cruising. I would also recommend 2 books: Marine Medicine by Dr Eric Weiss or Your Offshore Doctor by Dr Michael Beilan. With preparation and training, a scary situation can become more manageable. There are a lot of different factors to consider when making up a travel medical kit. The main 2 things I felt that we needed to consider were: 1) How and where are you traveling? 2) what is your crew’s medical history? 1. How and where are you traveling? So traveling on a boat has its own set medical considerations. Will there be off shore sailing and long passages? Will we be near a place with medical facilities? After Captain Dave’s fall, we certainly are more aware of the possibility of physical trauma. 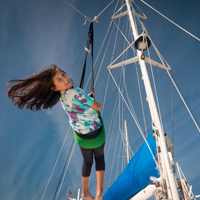 Trips and falls, possible head injuries … all these things can happen on a boat. On the plus side, we like to say that while cruising, you are out of the “viral soup” and less likely to be exposed to things like the flu. However, you may be visiting developing countries or places where certain types of infectious illness are more common (i.e. insect borne or water borne diseases). Thankfully, with some common sense decisions you can largely avoid many tropical illness ( i.e. wear insect repellant, don’t drink the tap water, only eat fruit that you can peel). So we are prepared on Exit Only for several different health scenarios — injuries, infections. We also prepared for travel overseas by getting vaccinated ahead of time — tetanus boosters, yellow fever, typhoid fever, hepatitis A, shingles vaccination, pneumococcal vaccination … We selected antibiotics to treat common infections, but also made sure to consider infectious which we might be exposed to overseas (i.e. traveler’s diarrhea). 2. What is your crew’s medical history? Our boat has 3 generations on board. Thankfully we are all very healthy. But if someone had a cardiac or diabetic history, it certainly would determine what would be included in a medical kit. With kids on board, we also needed to make sure that we have medications in pediatric forms for cough & cold, pain & fever, anti emetics, and antibiotics. We do have some medication allergies and food allergies, so we adjusted our medications accordingly. But certainly, if someone was doing what we are doing, it would be important to have their family physician review what medications would be needed for overseas travel and provide extended prescriptions for medications as needed. So whats in our kit? I bought large EMT bag on Amazon and packed it full of medical goodies. I was surprised that I could find a fair amount of medical tools and supplies (such as quick clot) on Amazon. This medical kit is tailored specifically to our family and our level of medical training. It may be used as a reference guide, but I would encourage you to discuss your own medical kit with your personal physician. The bag is organized into compartments based on body system. Each compartment is well labeled and subdivided with ziplocks. That way, if I ever do get called to an emergency situation, it will be easy to find the tools that need. As for medications, I had to consider both children and adults on board. We opted to get kid versions of certain meds. Not all medications would be advisable for children. Because our adult crew members are healthy with no significant medical problems such as heart disease, high blood pressure, diabetes, COPD, and renal disease; it made choosing our meds relatively easy. Please discuss with your personal physician what would be the best medications for your own medical kit. Antibiotics — at some point, someone will get an infection. We tailored our selection of antibiotics around various crew allergies and having a selection of kid appropriate meds. I do hope to potentially pick up some more antibiotics overseas. I am not sure at this point how readily available some medications will be. What we have is fairly basic and straight forward, but would cover ear/sinus infections, urinary tract infections, skin infections, gastrointestinal infections (i.e. traveler’s diarrhea). We don’t plan on going to any areas with known malaria, so I have not included any preventative meds. So I am pretty satisfied with our medication selection at this point. So this gives you a peak into what we have in our bag. I hope that we don’t have to break into it, but at least we are well prepared. Again this medical kit has been tailored to our family and level of medical experience. If you decide to build your own kit, I would encourage you to discuss what to include with your personal physician. We had a fun weekend here in Ft Pierce. We started off our Saturday morning with pancakes! Now that’s the right way to start the day! Or if you’re like me, pancakes + a large cup of coffee. The market was in full swing with loads of locals and tourists. The girls and I meandered around tasting samples of cheese, locally picked oranges, and fresh squeezed orange juice. We’ve had some beautiful Florida winter weather … sunny skies, temps in the 70’s and 80’s. 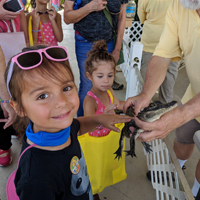 The Manatee Center hosted their annual Nature Fest which was perfect for the girls. It was filled with local vendors and groups that focus on sustaining the local environment. 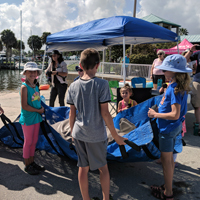 We had fun checking out the different stations … the coast guard gave us tips on PFD’s, the girls helped to fish trash out of the water, we had the chance to pet a live alligator, we learned about local kids who were working to clean up the reef … Very cool! The high point was probably being able to participate in a mock manatee rescue. 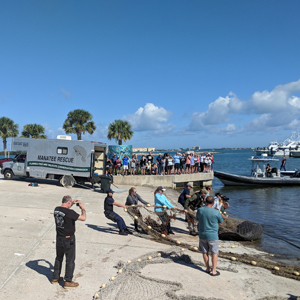 The same crew who had rescued the manatee about 2 weeks ago returned with their van and rescue equipment. The had a life sized manatee doll which needed to be rescued. 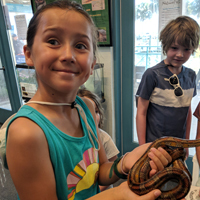 Zoe and Joss were thrilled to be able to participate in a rescue this time around! 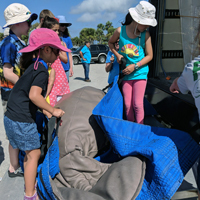 Along with some other kids, they lifted and moved the manatee doll into the carrier and finally into the van! Yay! We love helping animals! 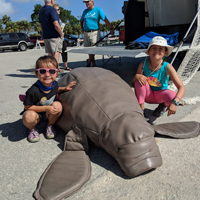 We learned that this particular team will rescue manatees from here in Ft Pierce all the way down to the Florida Keys. They can be called at anytime to participate in a rescue. It has been a particularly busy season. They’ve had 3 rescues in our area within the last 2 weeks. They will rescue orphaned calves, injured or hypothermic animals and then take them to a rehab facility before releasing the animals back into the wild. We were able to get an update on the injured manatee. Apparently, it is still recuperating down in Miami but we can check on their website and find out when it will be released. Our neighbors on SV Soul Meredian told us about a parade that was not to be missed. The Florida Crackers were coming to town. The Crackers are horse back riders who in the old days used to drive cattle across Florida. They are called “crackers” because of the whips they used to drive the cattle. People lined the streets of downtown Ft Pierce waiting for the Crackers. 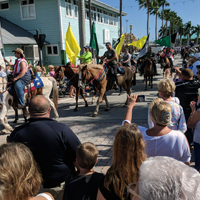 A group of about 50 horses and riders paraded through town. Some of the horses were decorated with ribbons and bows. Every now and then, you would hear the loud crack of a whip or a pistol. Joss and Zoe were so excited to see the the riders. Zoe wanted to know right away if we would be able to ride the horses. LOL. Unfortunately, no horse rides were available, but we thoroughly enjoyed getting up close and petting a few of the horses. After a fun day at Nature Fest and the Parade, we headed back to the boat for lunch. David had been working on the engine all morning. 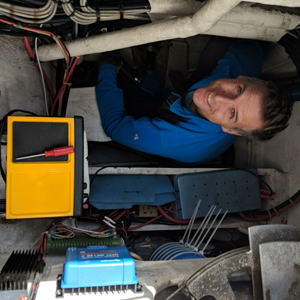 Every few days, David starts up the engines to help keep things lubricated but also to charge the boat batteries. He had noticed that the starboard engine was not starting smoothly. Over the past several days, David and Captain Dave had been running through the possible reasons for the engine problems. One possibility was that there air in the fuel lines. Or could it be condensation in the fuel tank. David checked the filters for any possible water. This didn’t seem to be the problem, but David did notice that the engine had an unknown liquid on it. It didn’t smell or taste like diesel or coolant, so he was concerned that water was getting into the engine room. The mechanic who had installed the engines dropped by to help him out. And of course, when David started up the starboard engine it didn’t cough or sputter at all! LOL! Well, Rob couldn’t see where was a problem but he did notice that there was some fine rust starting up which confirmed that there was a leak somewhere. 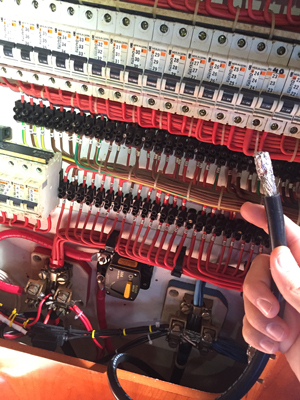 Now a leak on a boat is not a good thing. But more importantly, we needed to find said leak and get it fixed pronto. So David started a little investigative work to try and figure out the source of the water. Our bunk sits just above the engine, so David pulled out our mattress and the protective cover. What he found was somewhat of a shock! A thin layer of water coated the entire flat surface underneath the protective cover! From there, water was dripping down an access port into the engine room and onto the engine. But where was this water coming from? It was time for a little experimentation. We sprayed down specific areas around the cockpit that potentially could lead to our cabin — the base of the winch, around a cockpit locker, and finally the binnacle which houses our compass. And just like that we had our answer! 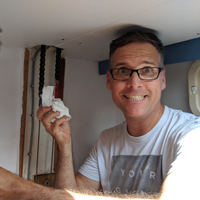 The moment water started to wash over the binnacle, David started to see a trickle of water come down along the steering cable conduit which passes through our cabin. Now would it be easy to fix? David then took apart the binnacle and found a loose gasket. Perhaps this was the problem. After much discussion with Captain Dave, they decided to caulk all these areas to see if it would fix the leak. 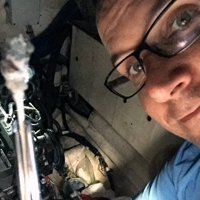 David caulked all around the binnacle, winch base, and more to help fix the leak. After 24 hours, we gave the binnacle the water test. And hurray, it looks like the leak has been fixed! We are still drying out a few areas in our cabin liner but everything has otherwise cleaned up really good. All that’s left to do is to put our bunk back together and clean up the engine. As I mentioned before, there was a fine layer of rust which had started to develop on certain parts of the engine. David plans on cleaning up the engine as best as he can and hopefully we won’t see any further rust developing. 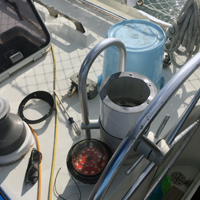 Gosh, boat life … it’s just one project after another. But I know that we are all thankful that this problem was found before we headed out to the Bahamas. Thank goodness for finicky engines! Lots of changes here over the last week. 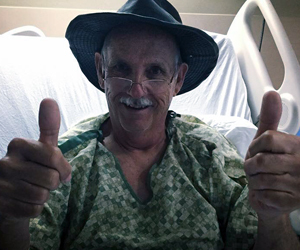 Captain Dave has been released from Abbie Jean Russell Rehabilitation and Nursing Facility. His medical team let him know that he had reached maximum benefit at their facility. He is essentially independent other than his continued use of the wheelchair to limit weight bearing. We knew that he was going to be released, so for about 4-5 days before we started to scope out local hotels. It’s high season on the Treasure Coast. So not a lot of availability right now. The important thing is finding somewhere that will be easy to access with a wheelchair. We’ve checked online and driven around town. Unfortunately, many of the local hotels have been booked or are not readily accessible with a wheelchair. One of the last places we checked was Red Roof Inn. The staff was very helpful and said that they had a ground level room, but it wasn’t a handicapped room. Donna went and checked on the room. The room looked good and even though it wasn’t classified as a handicapped room, it had all the safety grips in the bathroom that would be required. After booking the room, we started to gather the necessary equipment that would be needed over the next few weeks — crutches, walker, and bathroom stool. What a blessing to get this all sorted out! Now will begin the next phase of the recovery process. 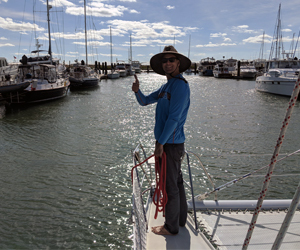 Captain Dave has been feeling so good, that I am hopeful that by his 2nd follow up visit that he will be cleared to return to the boat. Being at the Rehab facility was very motivating to get back out there sailing. He still plans on taking it easy at the hotel for the next 2-3 weeks, continuing his physical therapy and then we will see. When we went to pick Captain Dave up from Abbie Jean Russell, it was time to celebrate! So we headed over to Sonic and got his favorite Sonic Blast ice cream treat! Now we are supercharged to get this acetabulum healing!! We have settled into a new rhythm with Captain Dave over at the Red Roof Inn. Donna is staying over at the hotel to help out where she can. Every morning she returns to the boat and we start school up at 9 AM. 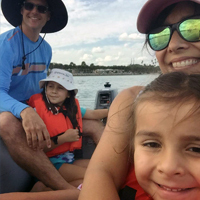 While the ladies work on homeschool, David tends to boat jobs or works on a writing project. Once school is done, one of the ladies whips up lunch. We pack up lunch and troop over to the hotel. It’s been nice to eat our meals together once again. The weather has warmed up so we are taking advantage of the hotel swimming pool. It’s been great for the girls to jump in the pool and work on their swimming. Zoe is like a fish in the water. She loves to race and playa games in the water. Joss is just starting to get co-ordinated enough to working on getting her stroke down. David has used it as a chance to test out some our video equipment. We got a go pro camera for this trip because we wanted to be able to get awesome underwater video. During the last trip, David only had a large video camera and we never had a good way to see underwater. All this new technology is amazing! The girls and David have had a blast jumping into the pool with the cameras, rigging up the cameras on the bottom of the pool, doing time lapses … all around fun! David has also put his video and musical skills to good use and started working on a rap video. Over the course of about 2 weeks, he wrote a funny rap about what our family has been up to, taught us all the song, cajoled us into being in a music video and then filmed it all!Everyone had ideas where and how we should film the video. 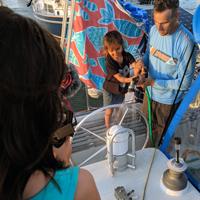 We shot scenes in the boat, on the foredeck, on the dock in our snorkel gear … Our neighbors watched bemusedly and tried to figure out just what exactly we were doing! I am sure that no one else on A dock is making rap music videos! The girls had great fun making the video. Although by take 20, their excitement had somewhat waned. I think it turned out great! Now I would not consider myself a rap afficionado, but it certainly was a lot of fun! After we had finished all our takes, it was time to put the whole thing together. David set up shop in the salon and spent several hours editing the rap video together. I think that it turned out great! Voila Acetabulum Rap! David posted the video on Facebook, Instagram and YouTube and the response has been very positive! We are up to 13,000 views now!! How cool is that! But really, it was all just about having fun! We hope that you get the chance to check it out. It’s been a busy 3 weeks in Ft Pierce, Florida. We survived our own version of the Arctic Vortex, took the girls to see Mary Poppins, and finally made it to the beach. We finally seem to have found our rhythm. A big cold front came down on us the last week of January into December. Temps dipped into the 40’s. It’s not that I can’t handle a little cold, but Exit Only certainly wasn’t built for it … and neither was Gaga : ). Exit Only is a wonderful Bluewater cruiser and excels in tropical conditions such as the Coconut Milk Run across the Pacific. We are not like a house with nice insulation and central heating. Every morning the inside of the hatches would be layered with condensation after a cold night. Maybe I was just dreaming it, but I swear I could see my breath one morning. So staying warm involved lots of layers, cozying up under blankets, and drinking lots of hot chocolate. Thankfully, we have some winter clothing with us here in Florida. Never did I imagine that I would be pulling it out here! After the cold continued for what seemed like days and days, we decided that we needed a girls day out! We have been waiting to go and see Mary Poppins Returns with Gaga, Zoe and Jocelyn. When we announced to the girls that we would be going to see the movie, they bounced through their school lesson at the speed of light. They love the original movie with Julie Andrews and know all the songs. The new movie was equally entertaining. I really enjoyed the underwater sequence and thought Emily Blunt did a fabulous job. For the next week, the girls kept singing Trip A Little Light Fantastic. This cold weather was the perfect opportunity to get off the boat and go somewhere warm and heated! We had 4 happy girls after a lunch at Chick Fil A and enjoying Mary Poppins. 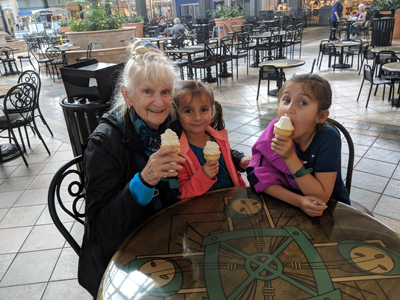 It's never too cold to enjoy an ice cream cone! Captain Dave has settled into Abbie Jean Russell Rehab and Nursing facility. We enjoy visiting him every day which usually involves bringing him some sort of treat. He has been doing great with physical therapy. We got to check out the PT department and talk with some of the therapists. Captain Dave is a motivated pupil. They’ve had him up and down, practicing leg lefts, using walkers and crutches, and building upper body strength. We continue to pray that this bone heals quickly and well. We counted down the days until his follow up visit with Ortho which arrived before we knew it. 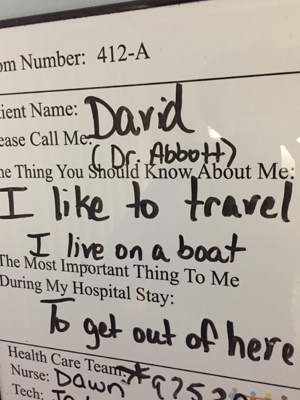 Captain Dave visited Ortho on February 6. David drove him to the appointment. They went ahead and performed an Xray to see how things are healing. It sounds like there has been no shift or worsening in the acetabular fracture according to the orthopedist. Captain Dave doesn’t have any hip pain 4 weeks after the fall, but Ortho still doesn’t want him bearing any weight for another 2-4 weeks. They would like him to follow up at least 1 more time, before releasing him. What we hope is that Abbie Jean Russell will be able to keep him for a while. After a successful doctor’s appointment, David and Captain Dave swung by the boat to say hello. It was great to see him outside the confines of the Rehab facility. We can’t wait until he can come back on board. We finally had a warm and sunny day. We've all been missing going to the beach, so we made Thursday a Beach Day! Even David decided to come with us! 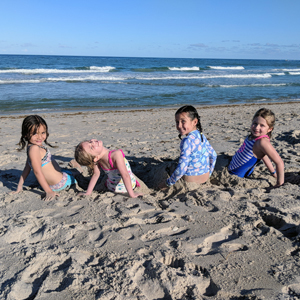 We enjoy going to Pepper Park beach which is on North Hutchinson Island. 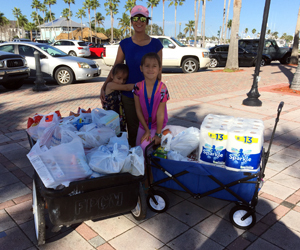 We loaded up with all our beach gear for a fun afternoon. The beach was crowded with tourists from the wintry north, AKA snowbirds! The water was lovely and clear and just warm enough to play in. The girls just love the beach. The surf was perfect for them to do a little easy boogie boarding. We searched for shells, built sandcastles and had a great time! The cherry on the cake was meeting up with another family who had 2 girls with the exact same ages. The girls hit it off and played happily together for hours much to the delight of both sets of parents. Now if this warm weather will just stick around!! With the sun back in town, it’s been fun to get out and about. 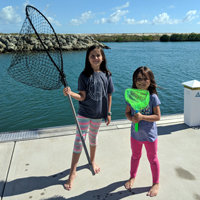 We try to find fun activities for the girls while we hang out in Ft. Pierce. 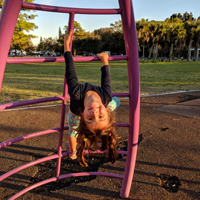 We have visited several of the local playgrounds and parks. We finally got out our IKEA Gung-gung swing. 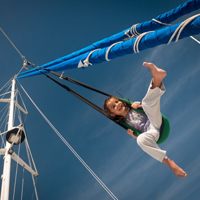 It's a portable swing that can be mounted almost anywhere. David strung it up over the foredeck of the boat. At first they were a little hesitant about the idea of swinging up and over the water. I think they were worried that they would drop in. But slowly, they became braver and braver, taking their swings ever farther. The girls love to play with water. Sometimes, the easiest and funnest thing is just to give them a big bucket and brushes to play with. We “paint” with the water on the dock and let our creations fade away. More often than not, this turns into a full on water fight! We like to scoop up water and look at the wildlife. Zoe catch minnows in her net. We occasionally bag a jellyfish. Then we pull out the microscope and investigate what we find. Another fun activity is exploring in the dinghy. We like to hop in and putter around the marina. David has started showing the girls how to steer. We always see lots of wildlife -- egrets, osprey, pelicans, and occasionally dolphins or manatees. On February 9, we were able to participate in an exciting manatee rescue. It was a beautiful Saturday morning in Ft Pierce. 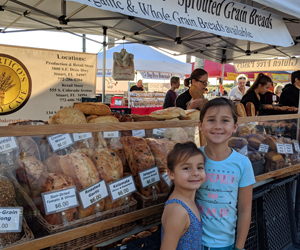 We had already hit up the Saturday Market for our usual fare of a chocolate croissant and blueberry muffin. On our way back to the boat, we noticed a Florida Wildlife boat circling in the marina with lights flashing. This continued for at least 1 hour. As they got closer to our dock, we saw that they were actually herding a manatee. 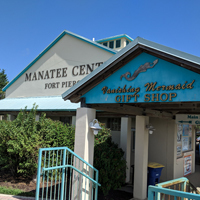 We see manatees and dolphins all the time in the marina. The girls and I ran to the end of the dock to see what would happen. It looked like this particular manatee had been injured. We could see that it had some marks along its back consistent with fresh wounds. Wildlife rescue had a diver jump into the water with the manatee. Slowly but surely, they were able to move the animal towards the boat ramp by the Manatee Center which was about a football field away. Dito, the girls and I decided to run over to the Manatee Center with the camera and get a better look. By the time we had arrived, a small crowd had developed. 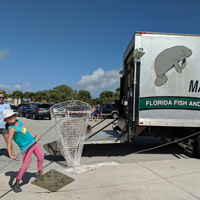 A manatee rescue truck was waiting for the wounded animal. The dive boat brought the manatee right up to the boat ramp. 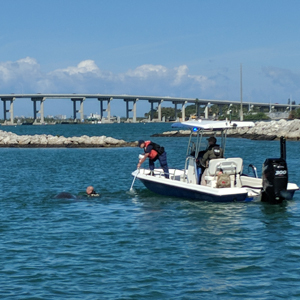 The rescue team went into the water with a large net and started to pull the manatee towards the shore. The team had a tarp set out to help lift the manatee into the van. The team rolled the manatee right onto the tarp, almost in the same way I've rolled hospital patients onto a new sheet. A grown manatee weighs about 400-500 lbs. The rescue team asked for the public’s assistance in lifting the animal into the van. David was able to go up and help move the manatee. A group of about 10-12 people gently lifted the manatee onto the van's lift and then into the back. We learned that the manatee had been struck by a boat propeller and sustained a collapsed lung. The manatee rescue team took the manatee to the Miami Aquarium for medical treatment. Hopefully, this animal will recover fully and be able to be re-introduced back into the Indian River Lagoon. It’s been a little more than a week since the “big fall of 2019”. Captain Dave has been moved to the acute care and rehab unit of Lawnwood hospital. He has been doing really well. Physical and Occupational therapy has had him up and moving around. They have been very encouraging with their own unique style of boot camp — 3 hours in the morning and 3 hours in the afternoon. The important thing has been building up his balance, right lower extremity strength and upper body strength so that he will be able to use a walker without risk of falling over the next 6-8 weeks. He has already been able to feel a marked difference in just the few days that he has been there. In his efforts to improve the healing process, Captain Dave has been upping his protein and calcium intake … ice cream with every meal, pot roast for dinner, and of course let’s not forget pizza : ) We are pretty sure this is making a difference, if not with his hip then definitely with his waistline. We’ve gone to visit him at the rehab facility every day. All the staff have been great. 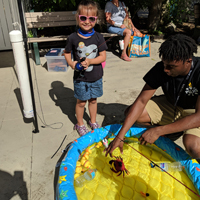 He has been in good spirits with a stated goal on his patient info board to “get back on my boat!” The girls have enjoyed visiting “Baba” over at Lawnwood, making him cards and personalized books to read. We even planned a pizza party of sorts. Friday night is movie night in our family. We usually have a pizza, make some popcorn and watch a movie together. We weren’t about to break with tradition even with Captain Dave being over at the rehab facility. So we grabbed a pizza at our favorite local spot and spend the evening together watching a movie. 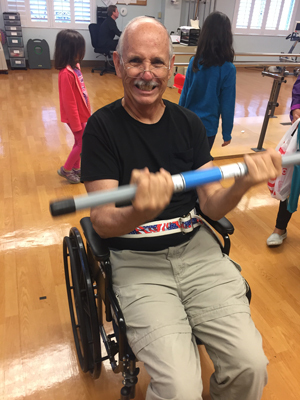 After 10 days at Lawnwood Rehab facility, Captain Dave was ready to be moved to a step down unit. Had this happened in Phoenix, where Dave and Donna live, he certainly would have already been discharged to home. Thankfully, the caseworker and medical staff have been very understanding. He’s in no condition to be flying back to Phoenix. He certainly can’t be back on the boat (which would require climbing on and off our floating home). They think we can get at least another 2-4 weeks at a different facility. They worked to find him a space at another local facility. So on Saturday, Captain Dave was moved to the Abbie Jean Russell Nursing Facility. He is still receiving physical therapy daily and has a wheelchair accessible bathroom. We hope that they will be able to keep him there for at least another 4 weeks, at which point he may be able to start doing a little weight bearing. This has been an answer to prayer. We will certainly take what we can get. And if the insurance company doesn’t believe that he continues to need this level of care and discharges him, we may have to find him a hotel room for a few weeks. But whatever happens, it’s gonna work out. Gotta just keep taking things a day at a time. Well … it looks like we will be delayed again. Last night, after the big provision and organizing rally, Captain Dave fell on the dock. It was about 930 and I was already in bed reading. David came and silently beckoned for me to come out to the dock. When I came out, I saw Captain Dave laying on the dock. I did a quick head to toe assessment. No obvious signs of head/neck injury. His only area of significant pain was the L hip. I didn’t seen any shortening or rotation of the hip to suggest an obvious hip fracture. So with David’s help we slowly got him up and sat him on a chair. 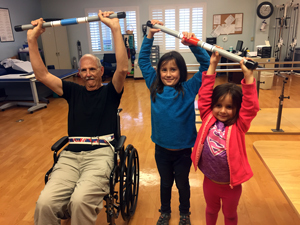 After a minute, we helped him stand up but he was unable to bear any weight on the left lower extremity due to extreme pain. At that point, I knew that we would need to get X-rays for a more definitive diagnosis. So a trip to the ER was in our future. It is a long way down the dock from Exit Only to the parking lot. As I peered down the dock, I made out one of the marina dock hands who was out clearing up the trash with their golf cart. I sprinted down the dock and caught the dock hand, who was more than happy to help us out. He quickly brought the golf cart up to Captain Dave and with a little help, we got him into the seat. We let Donna know what was going on. She decided to stay on the boat with the kids who were sound asleep. I knew that we would be for a long night. David and I quickly made our way up to the van. I was very thankful that we had a minivan that night. Easy for Captain Dave to get in and out of. We drove him to the local hospital, Lawnwood Regional Medical Center. Felt like a little of a homecoming for me, wheeling him into the ER. We took him right up to the triage RN who did a quick assessment and then he was taken right back. I was surprised to discover that Lawnwood is a level 2 trauma center. And as expected, Sunday night in the ER was busy. The good thing about being at a level 2 trauma center, is that they will certainly have speciality/trauma coverage. Captain Dave was quickly assessed by the ER RN. About 30 min later, the ER doc came by to check him out. He ended up getting a CT scan of the L hip/pelvis to determine if there was a fracture. Unfortunately, we learned that Captain Dave had a left sided acetabulum fracture. Thankfully, nothing was displaced and he had no neurovascular compromise. I was pretty certain that he wouldn’t require any surgery. But now the wait began for the trauma/ortho surgeon to come and check him out. Dave got moved into a room and the orthopedic surgeon came by several hours later. No absolute need for surgery which is a blessing, just 6-8 weeks with absolutely no weight bearing. Captain Dave of course, has felt terrible that once again our plans are delayed. I won’t lie … I was frustrated and a little discouraged. I started to worry about all the what ifs … So I had to shift my focus, off my so called problems and fix my eyes on all the many good things around me. Captain Dave and Donna are committed to this trip after all the time, money and effort that has already been put in. The dream lives on! But given the time frame for healing, this will certainly affect our cruising schedule. So for now, everything is a little up in the air. We may just end up doing the Carribbean this season. And that’s ok. There still so much to be grateful for and many adventures to be had. Captain Dave has bought his fishing rod! That means it almost time to leave. What that means for us ladies is cranking into high gear. It’s time to get the big provisioning done. Because we are planning for an extended cruising season, we need to stock up on a lot of different things. Last year, we had purchased many of these things already. But as we have been living on the boat for the past 5 weeks, some things need to be replenished. How much toothpaste does one need to buy? A special shampoo? A certain medication? School supplies? Toilet paper? I think that you get the idea. Donna and I went through all our supplies and tallied up what we had. We had an exact idea of what things we needed. We decided to make a run down to Costco in Palm Beach Gardens for certain bulk items. The girls always enjoy going to Costco. We made an afternoon of it : ) sampling new products and of course, enjoying a delicious frozen yoghurt. With a loaded van, we headed back to Ft Pierce, only to arrive after dark. The next day, we had David help us move everything from the van to the boat using our wonderful collapsible wagon. I swear, this is one of the best purchases that I have made for the boat trip thus far. 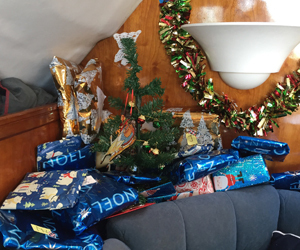 Once we had everything on the boat, it was a matter of finding room for everything. I could see the dubious looks on the faces of the menfolk. But I knew that we would have room for everything. With a little bit of organizing, we were able to find storage space for all items. Canned goods were tucked away in the pantry … 12 cans diced tomatoes up top, canned peaches/pears over there, 8 bags tortilla chips in the starboard hull, 18 bags of cereal, 20 boxes of long life milk in the starboard hull, 4 big bags of powdered milk, 25 lbs of flour, 8 bags of chocolate chips … Kind of like putting together a jigsaw puzzle! 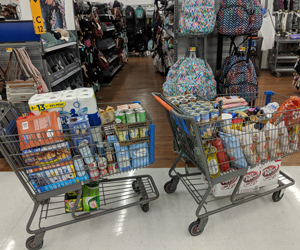 The following day, we made a trip to Walmart to get a “few” other things, but then we were mostly done. It took us most of the day to put stuff away. And somehow, we have to remember where everything is. Some things are more accessible than others. The things that we use most often, we try to keep just in reach. One other thing we consider on a boat is its movement. Things are rocking back and forth constantly. Sometimes it can get a little rough. Although we have a well organized pantry, everything is additionally boxed up, contained in another plastic bin. That keeps jars (which we cover with a sock) and other items from moving around too much and potentially causing a mess. Where possible, we also try to buy products which are in non breakable containers. Cardboard is not allowed on the boat either (it can carry the eggs of cockroaches and other bugs). Some items only come in glass. Sometimes we will transfer these things (i.e. a bottle of vinegar or olive oil) into a plastic container. Sometimes this means that we buy multiples of some products just for their container. 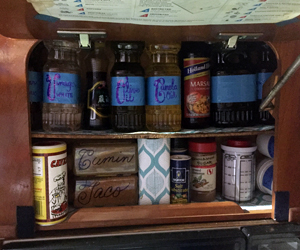 For example, we have a little cupboard in the galley for oils/vinegars. However, it will only fit a certain size of container. In order to maximize the space, Donna bought several contained of canola oil which were just the right size. She emptied out the bottles and washed them out. Now we have bottles of olive oil, canola old, and vinegar which fit perfectly. The final thing we will need to do is get our fresh products, but that won’t happen until 1-2 days before we actually sail out. Wow, this is getting real! 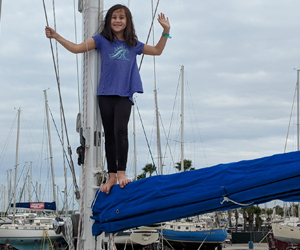 So excited to be thinking about sailing out of Ft. Pierce. 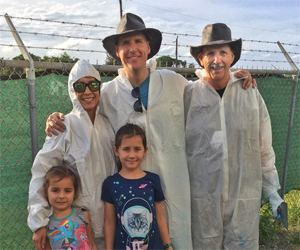 We’ve been enjoying the last 3 weeks here in Ft. Pierce. It’s hard to believe that we have already been at the marina for 3 weeks. The girls and I have gotten into a good rhythm with school. While we do school work, the guys work on their boat projects. Joss has been doing great learning sight words and working her way through the Bob book series with Gaga. 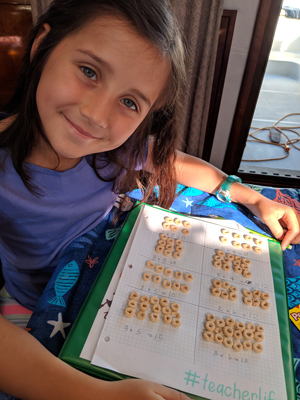 Zoe and I have been learning basic multiplication and about various animal habitats. Then it’s lunch time and we have a nice hot lunch on the boat as a family. After lunch, we often head out to the local library or the park. It's been such a blessing to have the local library right next to the marina. Just a quick walk down the dock and we can attend storytime and various library events for the girls to enjoy. Weather has been kind of up and down. It actually got warm enough this past week, that the girls and I made our way to the beach. It’s been so nice to be living somewhere warm on the ocean. It really does give us lots of opportunities to be doing things outdoors. We have also been making friends at the marina. 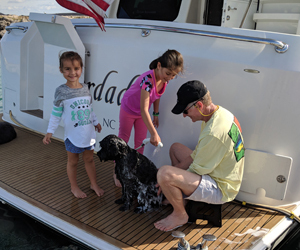 We have had 2 large powerboats next to us on dock A. Zoe and Joss have befriended 2 very friendly Portuguese waterdogs, called Bailey and Sophie on M/V Liberdade. Their owners, Bob and Dori, have been lovely and allowed the girls to help take the dogs on walks. Every day, Zoe anxiously waits to see when the dogs will come by. She’s always ready to take them out for a stroll. Bailey and Sophie have another furry friend named Charlie. He might be a little shy, but Zoe has slowly been working with him. Treats help! Everyday I’m sure to hear the question, can we get a dog!? I really like the idea of a dog on a boat. Donna tells me that originally, their family had seriously considered getting a furry friend for Exit Only. However, when they started to research what it would be like to travel in an out of many countries with a pet, it seemed like it could be rather unkind. Some places certainly have significant fees, but other places demand quarantine for pets. So no pets on Exit Only for now … but I wouldn’t put it past the girls to try and sneak some little friend on board. 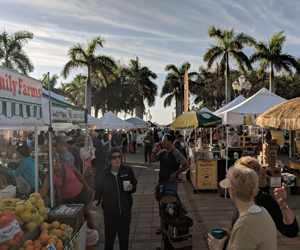 One of our favorite things here at Ft. Pierce has been the weekly market. Every Saturday, the vendors set up on the plaza with fresh fruits, vegetables, delicious baked goods. Some vendors cook up a full breakfast right there on the water front — eggs, hash browns, sausage, coffee … YUM! The smells fill the air as we walk down the dock. Even now, the thought it making my mouth water. However, our first stop is always the Importico Bakery stand where Zoe gets her pain au chocolate (chocolate croissant) and Joss a blueberry muffin. But I’m afraid that Importico’s is in for some competition! We have discovered (from another cruiser) a delectable donut shop called Dixie Donuts. Seriously, if you are ever in Ft Pierce, you have to check them out!! 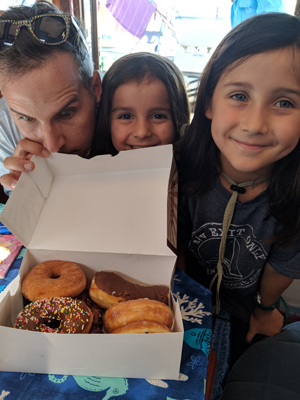 Their donuts are some of the lightest and most delicious that we have ever tasted! Blessings upon the cruiser who told us about this little gem! It doesn’t look like much from the outsides, but there is creamy, yummy goodness on the inside!! 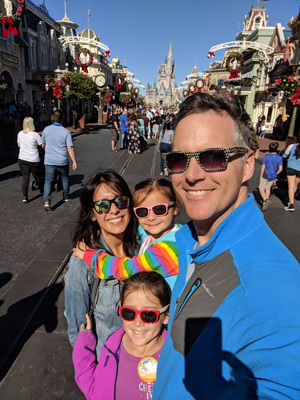 Since our time in Florida is nearing its end, we made the decided to take the girls to Disney before leaving on a world adventure. We made our way to the Magical Kingdom today. The girls are 4 and 7 years old. Seems like the perfect age to enjoy much of what Disney has to offer. We had never been to Disney before as a family. The last time that I went to Disney was for a church youth conference while in high school. 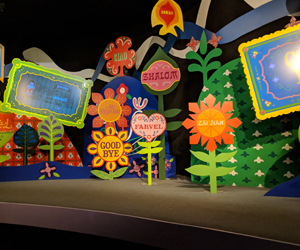 I have vague memories of Splash Mountain and Tomorrowland. The girls were balls of excitement and anticipation in the car. Every 10-15 minutes it seemed like we were hearing the question “are we there yet?”. We decided to stop for lunch before heading to the park. As we pulled into a local shopping center, the girls started to "ooo" and "ahhhh". This must be Disney, right?!! 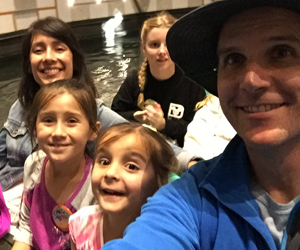 David decided to play along with them … "wWhat do you think of Disneyworld, girls? Isn't it wonderful? We will just have lunch here and then head back to the boat." You could see the confusion on their faces. Was this really Disney? They really had no idea what they were in for. David finally gave in and told them we hadn’t made it to Disney yet and they breathed a sigh of relief. Off we went again and finally made our way through the crowded gates. As per Disney, everything was well organized. David was determined to take the girls on their first ride. We set off in search of Splash Mountain. What you should know, is that the girls have never been on any type of roller coaster ride before. Our 2 kids reacted very differently as we waited in the line. Zoe as the oldest is a little more cautious and anxious about new experiences (...selectively, that is). Joss had not a care in the world. And if her sister acts one way then she is sure to act the other. As Zoe watched the other riders descend the water slide with screams, her anxiety level started to creep up and up. She convinced herself that this was the scariest ride in the world. There were tears and dragging of feet. And then suddenly, we were there at the head of the line. Would she do it? With some strong encouragement and lots of hand holding, she finally got into the log flume. I hugged her tight and she closed her eyes. She assured me that she wouldn’t open her eyes until the ride was over. But then slowly, one eye cracked open. A realization, “hey this isn’t that scary!” We went up. We went down. And then it was the big climb. Up, up, up … we were at the top of the big splash drop. The eyes snapped back closed and she gripped the safety bar with all her life. Down we went and splash! She had survived! It wasn’t that bad! And now that it was over, she was ready to go again! We decided that we needed a reward for this act of bravery and sought out the elusive Dole Whip cone. From there, we checked out the Swiss Family Robinson treehouse, watched a parade, rode through the classic It’s a Small World, checked out The Little Mermaid’s ride, walked through the Sleeping Beauty castle, rode a carousel, met a princess, glided around Tomorrowland … Our one wrong move was checking out the Barnstormer kids roller coaster just as it was getting dark. 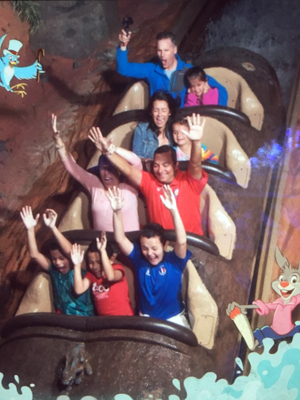 The girls were hesitant, but after the success with Splash Mountain, we felt like they could handle it. It probably was the combination of the darkening sky, fatigue and hunger, but let’s just say that it wasn’t exactly a high point. Both girls were excited. Joss sat with David. Zoe sat with me. Around we went, up and down, zipping here and there … but in the near dark. When the ride was finished, David told me that about halfway through he realized that Joss’ screams weren’t a sign of enjoyment, but rather terror! The poor kiddo was absolutely petrified. Parenting fail. 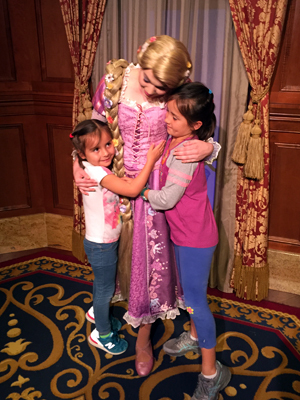 After lots of hugs, she has now fully recovered and says she wants to go back to Disney. So thankfully, we didn’t ruin the whole experience for her. The cherry on the cake was the final show of the night. We had arrived late enough in the day, that we stayed until the sun went down. The nightly fireworks show was about to start. The masses were all crowded around the castle. We made our way to Main Street and waited for the show to begin. 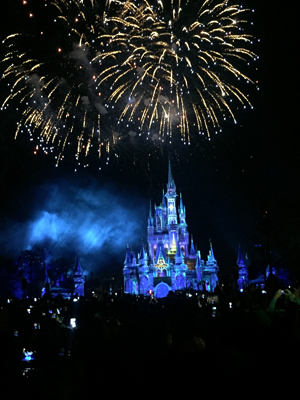 It was a wonderful fireworks show incorporating many different Disney characters and songs. The girls were delighted! When the show was over everyone made a run for the front gates. What a day it was! I think this dose of Disney will do me for the next 10 years, at least! : ) It was a good experience and I am glad that we got to share it with the girls. But I am really looking forward to sharing adventures with them on the boat, cruising and meeting new people from all over the world, learning about new cultures and places. We are into the final stages here in Ft Pierce. The guys have largely finished their major boat projects. Dave has said that we will know he is ready to go when he buys his fishing pole. We still have our car down here in Florida. It has been indispensable but soon it will need to go into storage as well back up in KY. So we have been talking about when it will be the best day to drive back up to KY.
We headed down to Ft Lauderdale for a final time this past week. We needed to visit Bluewater Books and our friends, the Bodde family. We went down to Bluewater books last year. 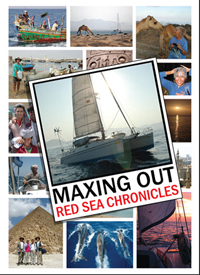 It’s a great shop for cruisers with maps, charts and cruising guides. Unfortunately, last year Dave was feeling so bad (from what we now know was a gallbladder attack) that we never really finished up. This time around, we had a mission — get electronic charts for the new navigational system on board Exit Only. We have always had a combo electronic and paper charts on board. We have an electronic chart plotter which allows us to see e-charts at the nav station. It is tied into our auto pilot. This allows us to plot our course on an electronic chart and map our sailing progress. Charts are so important for cruisers. It shows us water depth, underwater masses, coastlines … etc. We can plot our course on the electronic charts. But we can’t solely rely on them. Electronic charts and paper charts aren’t perfect. Particularly when we get out to the South Pacific, there are areas which haven’t been mapped in years. Some area of the South Pacific still rely on maps which were charted by Captain Cook over 200 years ago. And surprisingly, these old charts are quite accurate. Our new charts won’t show all the coral formations. 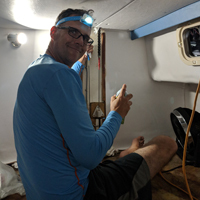 So for example, if we are coming into a new anchorage (preferably in the morning with good light, you never want to come into a new anchorage at dark) in the South Pacific, David will actually climb up the mast and into the spreaders. From there, he will be able to see the coral bommies and tell us where to go. Definitely don’t want to hit any coral bommies and put a hole in the boat. 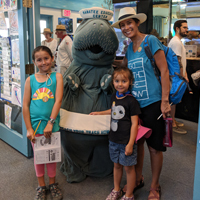 Bluewater books was a complete success! 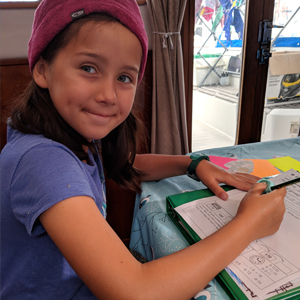 We have maps for the Caribbean and the South Pacific which will now be uploaded on the boat’s laptop and chart plotter. We spent the rest of our day visiting the Bodde family. Dave, Donna, and Dito have known Phillip Bodde for years. They met up in the South Pacific in 1993/4 while Phillip was crewing on South African boat. It’s always a treat to visit with Philip and Debora. They have 2 of the cutest little kids (Zoey and Bruno). They are dreaming of going sailing again too! Maybe we will see them out there. That’s one of the great things about cruising. You meet wonderful people along the way and develop friendships which will last for years. Happy New Years to all our friends! We have been at the marina now for the past 2 weeks. Lots of work has been done of the boat. The guys have jumped right into finishing projects. The big projects for now have been the wind generators and the radios. As you may have noticed we have 2 Aerogen wind generators on Exit Only which we use to produce electricity. This is one of the things that I really like about living on the boat. We are using sources of renewable energy to help power our adventure. What a great lesson for the girls! These particular wind generators are no longer in production. They were totally dismantled for 11 years while the boat was on the hard. 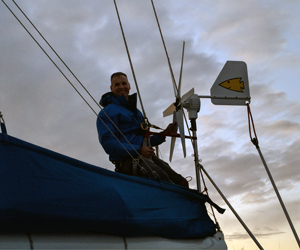 When David initially put them back together, we noticed that the port wind generator was not spinning well. We thought that this might have something to do with the ball bearings on the inside of the wind generator coils. So David took the wind generator parts to a local mechanic shop to see what they could do for us. Unfortunately, even though they carefully took apart the wind generator and then put things back together, it still would not spin properly. So this time around, the guys took the blades to a local post office and had each blade weighed precisely. Back at the boat, they carefully aligned the blades so that the weight was evenly distributed. David was then hoisted up onto the boom and re-installed the blades. It seems to have helped some, but we are still not there yet. Hopefully once we get into steady trade winds where the generators have a real work out, it will start to run better. If our generators are working properly they can make up to 100-150 Watts per hour in steady trade winds. In this technological age, we will need all the energy we can get. The 2nd big project has been the radios. We communicate with both high frequency and low frequency radios. 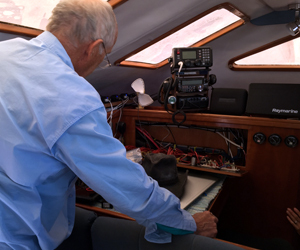 The high frequency radios can be used with programs called SailMail and Winlink. We can receive email and all important grib files (weather reports which provide information about the wind) by using these programs. We had to replace the 25 year old high frequency radio on Exit Only. It was toast! In order to use the high frequency radio, one needs a ham license. Dave and Donna both have their ham radio licenses from their Navy days in Puerto Rico. In fact, the Abbott and Austin clans got into ham radio as a means to stay in touch with each other overseas because international phone calls were so ridiculously expensive back in the day. David is looking into getting his own Ham license and is currently studying for the test. 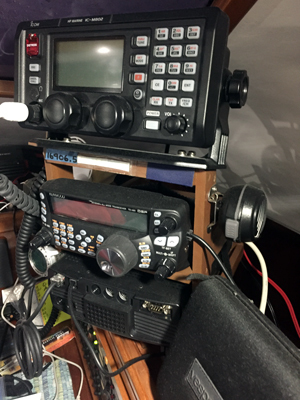 It took a few days of wiring and drilling to get the radios installed. Of course, nothing fits exactly into the old radio frame. But once everything was hooked up, David and Dave were able to get a signal. They dialed and fiddled with the SSB unit and suddenly we started hearing various conversations crackling over the radio waves. Dave started calling out on the SSB to see if other radio operators could hear him. 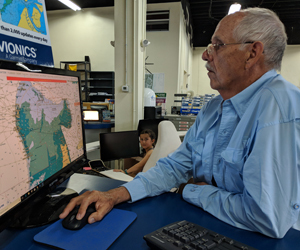 He was able to get in touch with someone in New Hampshire and New Mexico, so it looks like we are up and running there. In terms of other communication on the boat, we will have a satellite phone. But this will only be used in care of emergency because it is stinking expensive. For now, we are still all able to use our cell phones but things will change once we get out into the islands. Most places won’t have easily accessible internet when you are cruising remote islands. In different countries, you may need to buy a SIM card and data plan from a local provider. David and I had researched phone plans which will work well overseas. We decided to go with Google Fi. As long as I can get a signal, I should be able to send unlimited texts internationally without incurring any significant charges. We hear good reports from other cruisers about Google Fi. We definitely want to keep in touch with family and friends. 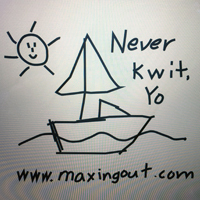 If we are able to get a wifi signal while at anchor or on land (for example, from a local restaurant or resort), then we should be able to hook up with the internet to update Facebook, Instagram, and www.maxingout.com. When we cruised 12 years ago, the cell phone age was coming into it’s own. In order to access the internet reliably, we had to visit a local Internet cafe. From there, we would update our website and cruise the net. I’m sure that things will be radically different this time around and look forward to seeing how technology is changing things. 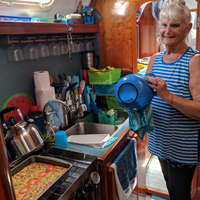 The ladies have been getting back into the swing of living on the boat. We’ve come up with meal plans for the boat. We all really enjoy Tex Mex. Some of our favorites have been the classic Abbott “Mexican dinner” (essentially chili which gets souped up with chips, salsa, sour cream, guac, onions, salsa), enchilada bake, and oven nachos. 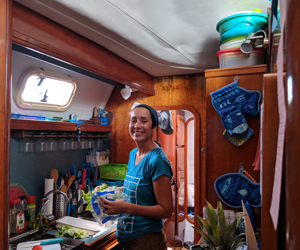 What you learn cooking on a boat, in a small space, in the heat … is to try and make meal prep as easy as possible. Especially on passage, you want things to be as straightforward, accessible and easy as possible. Make sure you have all your ingredients ready to go so that you can just dump, cook, and go. When we do prepare for an upcoming passage, we usually throw together a meal or two ahead of time. That way, you’re not struggling to pull out ingredients on a rolly boat. One of the things that we’ve done in the past is make up a big back of popcorn which is ready to snack on while we are on passage. That way, there’s no need to pull out the stovetop popcorn maker. We’ve done a lot of sandwiches lately because their easy and we all like them. I am often on the prowl for new recipes. We try to eat fresh wherever we can, but there will certainly be situations where we will be making meals from cans. I am looking forward to some fresh fish once we pull out the fishing rods. The last time I sailed on Exit Only for an extended period time, we didn’t do that much fishing. But this time around, I am really looking forward to sampling fresh mahi mahi and tuna! I think that I would like to try some more recipes with an Asian twist to them. Maybe poke bowls with fresh tuna. Or a nice vegetarian curry. I have fun just thinking about the different recipes we might be able to try out. 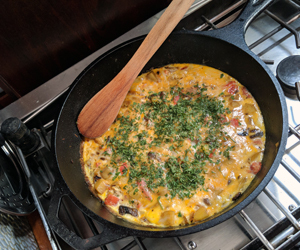 What do you enjoy cooking that is easy to throw together? Send me some recipes!! (@maxingoutlife on Facebook). 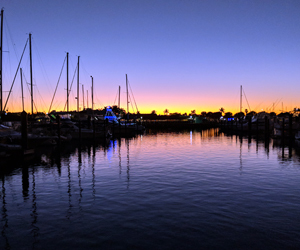 Merry Christmas from Fort Pierce, Florida. We have been in Florida now for 10 busy days. We really hit the ground running. The day after we arrived, our family headed to the boat yard to check out Exit Only. There she was, ready and waiting for us. 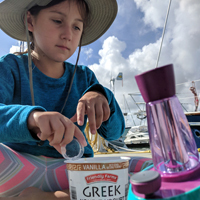 David, the girls and I got to work … we put the Bimini cover back up, pulled out the dinghy, put the kayak and paddle board back into their holders, and generally tidied up. Already waiting for us in the marina office were 5 cans of anti fouling pain. After David had posted on Instagram about our barnacle debacle, West Marine and Pettit Paints reached out to us. They wanted to make it right and figure out which batch of paint was having a problem. 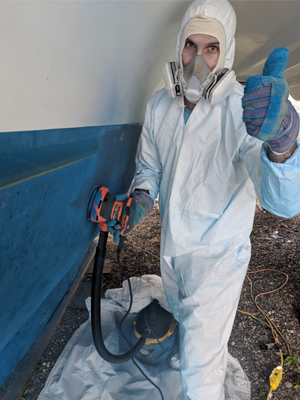 So they gave us 5 cans of their best anti-fouling paint to redo our bottom job. Let's hope this does the job the 2nd time around!! We are staying in a condo nearby until the boat is put back into the water. They won’t let us live aboard while we are in the boatyard. The girls were so excited to be back. The first thing they wanted to do was check out their bunks, see their toys and friends. It was re-assuring to see how excited they are about being back. They are taking all the changes in stride. Dave and Donna arrived the day after us. Exhausted, but always ready for a new adventure! It was back to Exit Only the following morning. 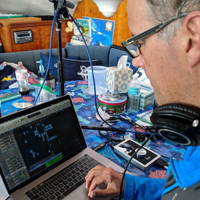 The guys started writing lists of all the supplies they would need to complete the bottom job … sanders, rollers, tape ... Over the next 2 days, Dave, David and I started working away at the hull. Remnants of barnacles were everywhere. These crafty critters attached themselves to the hull, the props, the shafts, and the keel. 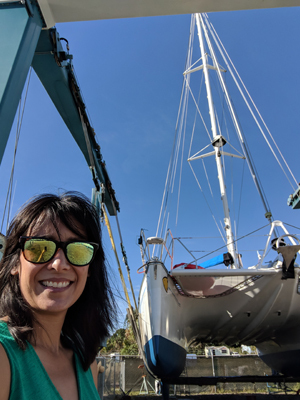 Even though the boatyard crew had done a great job or power washing and scraping off a large portion of the barnacles, the base of the their exoskeletons stubbornly remained attached to the hull. The only way to get these bad boys off is some good old fashioned elbow grease. Using paint scrapers, we started working away at the barnacles. We needed a smooth surface before we could apply any bottom paint. Scrape, scrape, scrape … off with the barnacles. And as we scraped, a fine dust of old bottom paint came away too. 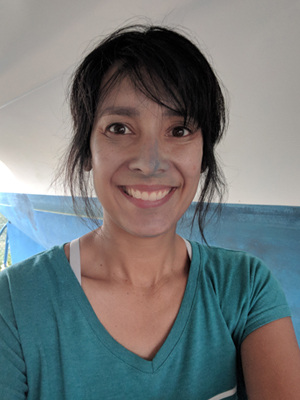 By the end of the day, I was quite blue … blue hair, blue hands, blue shoes! Thank goodness of paint coveralls and face masks! The calvary arrived on day 2 of barnacle scraping. Our friends, Dani and Kellie, arrived from Lexington. Dani jumped right in and started scraping away. Thanks Dani! After the scraping, came the sanding. All the old paint came off. We then had to rinse off the hull and then wipe it down with acetone. This left us with a clean surface for the new paint. We made sure this time around that everything was done exactly to the manufacturer’s specifications. David taped off the waterline and we were ready to paint. Using the 5 cans of paint, we managed to cover the hulls with 3 coats of bottom paint. Take that you barnacle scum! Hopefully, 3 coats of bottom paint will keep the barnacles at bay. We just needed to let the paint dry and then Exit Only would be ready to splash back into the water. 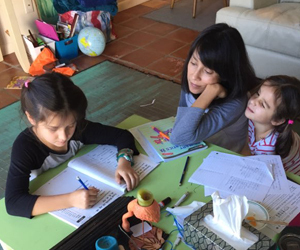 While the guys have been working on the boat, the ladies have been getting back into homeschool. We’ve been on a break of sorts for the last week between getting the house packed up and coming down to Florida. Not surprisingly, there’s been a little resistance getting back into the school groove. Joss has been working on pre-K and kindergarten topics. I think that we will have her reading before long. Zoe has been making her way through second grade topics. Every day, the girls journal about what they have been doing. This is helping Zoe with her writing skills. I am hoping that it will also make for a fun momento to flip back through. We try to incorporate learning wherever we are. Art and crafts, museums, parks, beaches … there is always something to learn. It’s still a little challenging for me. I’m a by the book kind of gal. But we are making it work. December 19 will be splash day for Exit Only. I’ve been on board several times making preparations for our move. We have packed up the condo. Everything has been freshly laundered, wiped down, vacuumed, ventilated, painted … We are ready to go. The travel lift is scheduled to pick us up at 1030. We met Dave and David at the boat. The guys have everything cleaned up around the boat. Final little touches of bottom paint here and there done. David has his Go Pro Camera ready to go. Time for last minute pictures! And then time for a little christening for good luck. 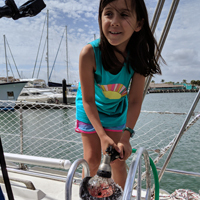 We made up our own little christmasy bottles of water to break on our hull. We may not be as large as a cruise ship, but we certainly deserve a big send off after all we have been through this last year. Before we knew it, Exit Only was being gently lifted up by the travel lift. Here we go! Across the boatyard we went for a 2nd time this year. Back into the water, fire up the engines, check the lines! 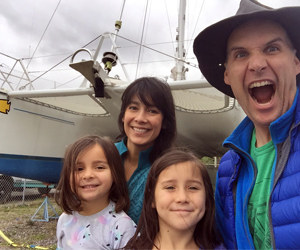 This time, the captain consented to have Zoe and Joss along for the ride to the marina. The girls were so excited to be on board that they were practically vibrating . It was the first time they actually have been on board while the boat was moving. Thankfully, it was a beautiful day. The sun was shinning brightly. There was a light 10 knot breeze on the water. Smooth sailing, or rather motoring for us across the Ft Pierce inlet and lagoon. (we haven't put up the sails yet) As we made our way across the water, a small pod of dolphins came to greet us! It must mean good luck! About 2 miles away is the Ft Pierce City Marina. We were at the same marina last year. It was a great location for us … right downtown on the water front, near the library, shops and restaurants. We plan to be here for at least the next 2-3 weeks while boat jobs get finished up. As we pull up to the marina, David called into the dockmaster to find out where they want us. Funnily enough, we ended up back on A dock just a few feet away from where we were before. We had all our dock lines and fenders ready. Donna was waiting for us on the A dock. Slowly and expertly, the captain lined us up with the dock. David threw Donna a dock line and with expertise she looped the line around the dock cleat. We have arrived!! 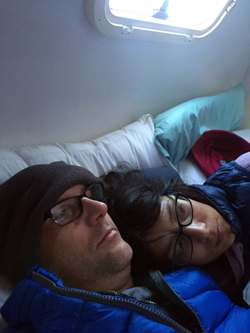 We had planned to get settled into the boat over the next day or two. The weather unfortunately started turning bad. There was a major storm system that came through. So we headed back to the condo. We didn’t want to move on board while it was pouring the rain. 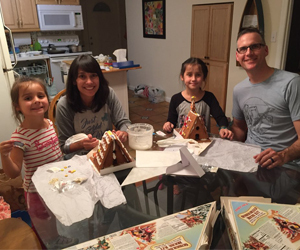 (Not a good idea to have wet things on the boat) The girls and I had some gingerbread house making to do. We bought 2 gingerbread house kits for the girls back in Kentucky. They had been semi-patiently waiting to finally build and eat them. It seemed like they were asking me every day when it would be time to build the houses! Joss and I went more traditional, while Zoe and David decided to mix it up. Now we will just have to see how long these candy creations survive the nibbly fingers of children! The weather finally settled down on Friday and we made our move. Somehow it seemed like I brought more back to the boat then what I left with in July. With growing girls, I will need to go through all our supplies and clothes (again) to see what fits now and what will still be good for later. I feel like I’ve completely forgotten what I had packed away for them. If only they would give this growing thing a break! LOL! Donna and I will need to go through our food supplies. David had cleaned out a good deal before he pulled the boat out in July. But even though certain foods may have been boxed or “zip locked” up, they don’t really keep their freshness. What surprised me though was a forlorn bulb of garlic which had survived the Florida heat for 6 months without going bad! Now that is an accomplishment. 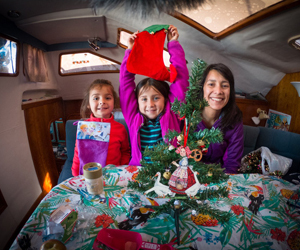 We are looking forward to spending our first Christmas onboard Exit Only as a family. Even though we don’t have a lot of space, the decorations are going up right and left. We have a small tree, wreaths for the doors, tinsel to hang, Christmas carols to sing … The girls so excited to pull out the tree and start decorating! And of course, “don’t forget our stockings, mommy!” It may not be cold down in Florida, but we know how to do Christmas up right. 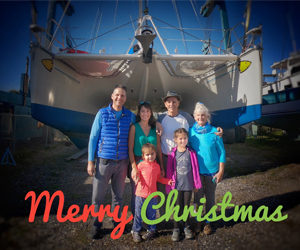 As we prepare for Christmas, I hope that you are your family have a wonderful holiday season as well. We have so much to be grateful for this year. It’s made us even more thankful that we get the opportunity to have this adventure as a family. It’s been 6 months since I put any real update on Maxingout. It’s been a busy 6 months since we had to leave the boat due to unforeseen illness. Captain Dave unfortunately became quite ill about 2 weeks before we planned to leave for Panama. This required him being back in Arizona for emergency surgery and recovery over the last 6 months. Thank the Lord he responded to all the medical treatments and now is back in tip top shape. 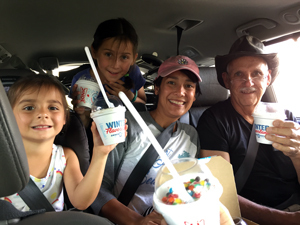 While Captain Dave was in Arizona, our family headed back to Kentucky. We knew that it was going to be a long recovery and Exit Only had to be pulled out of the water during hurricane season. We weren’t sure when we would be able to return to the boat. Nothing seemed to be going according to plan over the last 6 months. At times, it just seemed like one roadblock after another. In the moment, those roadblocks were discouraging and a little disconcerting. But in the midst of the uncertainty, this “pause” of sorts allowed me the time to re-evaluate. 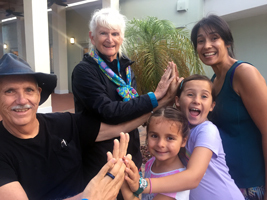 It provided the opportunity to reconnect with family, friends and work. It really was a blessing. Had we set out as planned, we certainly would have had a medical disaster on our hands. I truly believe that the Lord was working through those roadblocks, as frustrating as they were. His timing is perfect and His plan is perfect. Even as we were back in Kentucky, doors continued to open for our family. Although we had rented out our home for 12-18 months, our tenants suddenly decided that they needed to move out. We were able to move back into our own home almost as if we had never left. A co worker needed help due to family illness and I was able to step in to help cover shifts in the Emergency Room. David was able to step back into playing with our church's worship team and enjoy performing music. Zoe and Joss were able to see some their school friends. Our church had a Women’s Bible study series planned for the Fall about knowing the will of God. This fell squarely into where my heart and head were re-evaluating our family’s priorities. It was just one thing after another … stepping into the next all the while knowing that He has already gone ahead. And so 6 months after being back in Kentucky and watching the Captain slowly recover, we decided that it was time to head back to the boat. Time to try again! We decided that this time, it woudl be too much trouble to rent out our home. So we packed up the house and put it on the market. It was a crazy couple of weeks between working full time, doing homeschool, prepping the house for sale and packing up all our belongings. I think I'm still recovering from all the craziness! 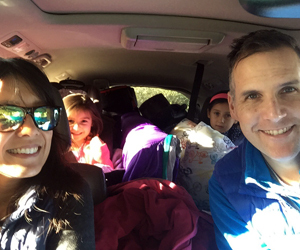 December 13, we started the long drive back down to Florida. Once we get back to the boat, we still will have some jobs to do. Thankfully all the big stuff is behind us. The main job will be working on the bottom paint. If you have been following our adventures, you may recall that we had a major barnacle problem. 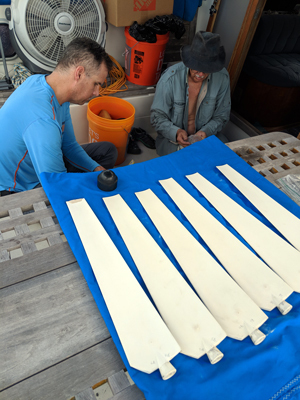 Boat hulls are painted with a special anti-fouling paint which helps to prevent growth of barnacles, sea grass … etc. The less growth you have on the bottom of the boat, the better you will glide through the water. Exit Only received a fresh bottom job about 1 week prior to going back into the water in May. We sat in a marina for about 8 weeks before she was hauled out again. 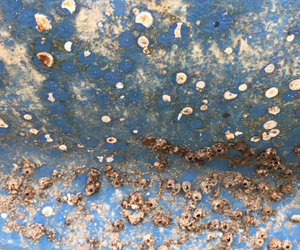 To David and boatyard crew’s surprise, the bottom of the boat was covered with a crazy amount of barnacles. This should never have happened in just an 8 week period. As far as we know, the paint was applied properly. So we think that we may have had a bad batch of anti-fouling paint. 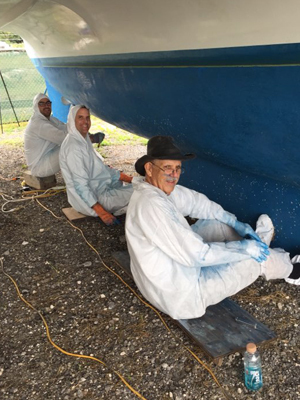 The boatyard crew used a pressure washer and scrapers to get a good portion of the barnacles off. However, there was still a good amount of barnacles to deal with. 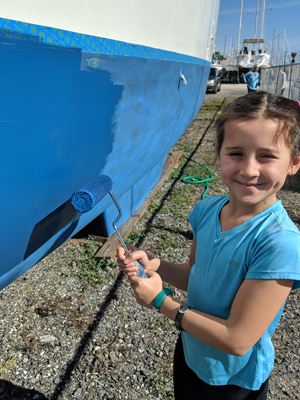 Once we get the bottom of the boat fully cleaned off and prepped, we can go ahead and apply a new coat of bottom paint. Other jobs will include putting the sails back up, mounting the wind generators, installing the high frequency radio and fresh water maker. It might seem like a lot, but after all the hard work the guys put in this past fall and spring, I am hopeful that within 2-3 weeks everything will be done and we can set out for warmer waters. Thanks so much for continuing to follow our sailing adventures. I will be trying to post new updates regularly so that you can follow our progress. Thanks for your patience. We will try to get back up to speed as soon as we can.